Home > METRIC V-BELTS > K Section Metric V Belts for Specialty Machine Tools. > K38 Metric V Belt. Import K38/K965 Industrial V-Belt. > K30 Metric V Belt. BANDO K30/K762 Industrial V-Belt. > K27 Metric V Belt. BANDO K27/K686 Industrial V-Belt. K27 Metric V Belt. BANDO K27/K686 Industrial V-Belt. 5/16” Wide x 27” Effective/INSIDE Length (686mm). 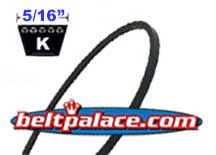 Superior replacement for Import brand Metric K27 V-Belts. Use Bando K27 for their durability and extra long service life. Heat, static, and oil resistant. OUT OF STOCK. WILL HAVE MORE BY JUNE 2019. 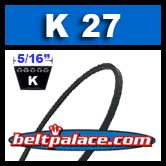 Import brand K27/K333 Metric V-Belt. V-Belt Standard K Type K27. Machine Transmission Band Wedge Rope K Type V-Belt 5/16" x 27" inside Circumference. Rexon "V" Belt for DP2300AL. POWERMAX Drill Press 04-048 V-belt (K-27).